Museum Of Bad Art Gives A Home To Forlorn Paintings As curator of the Museum of Bad Art outside Boston, Michael Frank stays on the lookout for atrocious acrylics and inferior oils. He frequents garage sales and thrift stores -- and drives extra slowly on trash night. Ronan the Pug -- Erin Rothgeb. 24”x18", acrylic on canvas board. Purchased at a Boston thrift store. The head of a museum like MOMA probably doesn't look for its next big find at garage sales or thrift stores -- or drive extra slowly on trash night. But, as the head of the Museum of Bad Art, Michael Frank is a rare bird: He's the arbiter of the atrocious. You might wonder: What makes a piece of art bad? Frank uses the same criteria a judge once famously applied to obscenity: He knows it when he sees it. "What we look for are pieces of work that are produced in an attempt to make some sort of artistic statement -- but clearly something has gone wrong," he says. "There has to be something about it that makes you stop, and very often wonder why the artist continued down the path to produce what he or she did." Louise Reilly Sacco, one of the Boston-area museum's co-founders, said the idea began in 1994, when her brother, Jerry Reilly, hung up a painting that an antiques dealer was about to toss onto the trash pile. The dealer had only wanted the frame, not the dubious picture it contained. We celebrate these pieces, and we enjoy them. Once you get beyond the name of our museum, we never say bad things about them. After that painting went on display, Reilly's friends started contributing their own bad art, and the collection grew. The museum now occupies the basements of two theaters in Dedham and Somerville, just south of Boston. Visitors can expect to find works like "Dog," which literally blurs the line between artistic genres. When asked to describe the piece, Sacco hesitated. 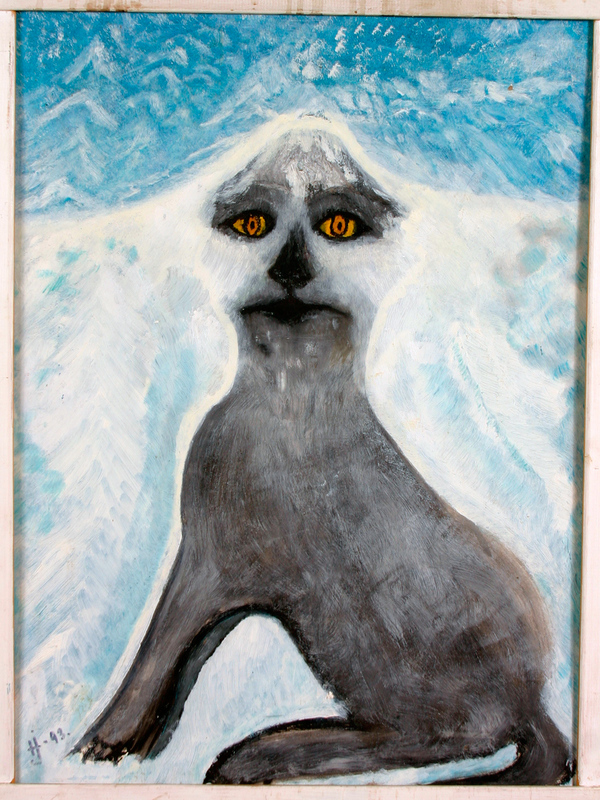 "Uh … It's a puppy who's staring straight ahead with bright yellow eyes," she says, "but then at the top, it seems to turn into a mountain covered in snow that melds into the puppy's head." Døg -- artist unknown. Acrylic on canvas. Donated by Elizabeth and Sorn Poeckle, Copenhagen, Denmark. Many people have donated their own art to MOBA, as its founders call it. "We celebrate these pieces, and we enjoy them," Sacco says. "Once you get beyond the name of our museum, we never say bad things about them. We want to share them." The museum also includes a brief interpretation of each piece. 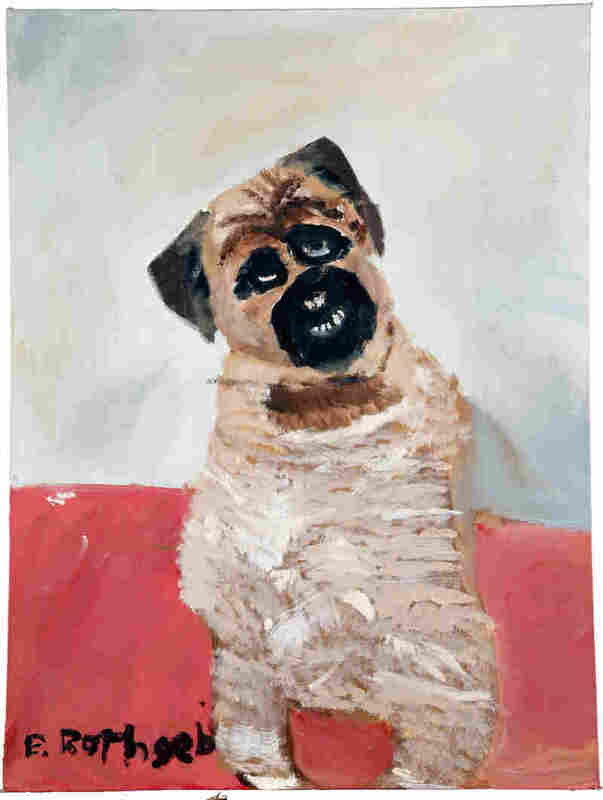 Take "Ronan the Pug," Erin Rothgeb's rough acrylic painting of a dog. His eyes glazed and his mouth agape, he looks as if he's had too much to drink. He occupies a one-dimensional space, free of shadow or foreshortening. According to the museum's catalog entry for the work, Ronan "could hardly see straight after lapping up all the spilled eggnog at a holiday party, but brought tears to everyone's eyes with his clear tenor rendition of 'Danny Boy.' "
The Museum of Bad Art in Dedham and Somerville, Mass., was founded in 1994; admission is free.